Top Uses of Built In Bookcases | Experts in Crown Moulding, Wainscot/Beadboard, Coffered Ceilings, Custom Casings, Baseboards, Chair Rails. Built in bookcases in Phoenix add grandeur to any space. For those who like elegant atmospheres, they can choose the styles that fit in with their décor. Adding furniture is an easy way to spruce up an area, without changing much of the surroundings. 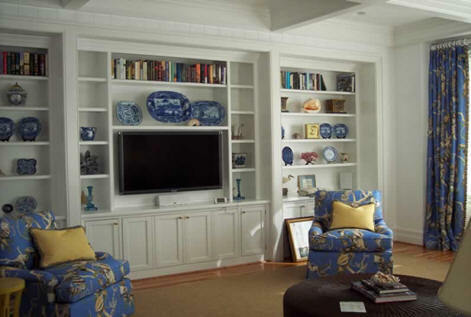 Built-ins are great, because they are custom made to fit into their designated areas. This creates a good flow and impression for any visitors that come over. Bookshelves are seen as reliable storage and add charm to the rooms. In older homes it is common to see built-ins; people can choose to add a little old fashioned touch to their homes without going overboard. A big trend is mixing new and old touches, to create the perfect happy medium. Everyone is bound to find the perfect compromise; they just have to try out their options. The most common use for them would be to display their books. Many people dream of having huge libraries. This is very possible with built-ins. There are many companies that are available to create the perfect bookcases that mirror their desires. Bookcases are not always thought of as artistic canvases of expression; however, they very much are. The possibilities are endless, because the owners can style them however they desire. By adding: vases, pictures, awards, art, and other objects, they are creatively expressing themselves to their visitors. Their whole story can be laid out. For those who want a different approach to clothing storage, they are able to utilize shelves. Sometimes dressers are too bulky and take up too much necessary room. By adding built-ins, they can successful store their clothes and add other objects for decoration as well. The possibilities are endless and rely on the people’s needs and creativity; however, they add to the homes and make areas flow.